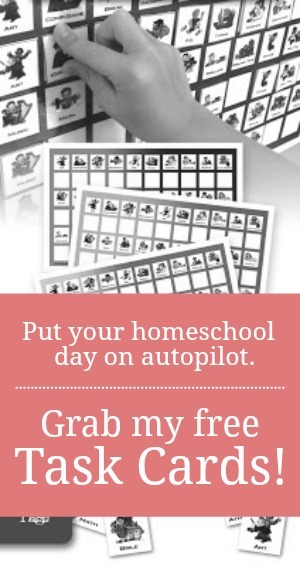 If your household is anything like ours at The Unlikely Homeschool, you probably have at least one little Tot desiring to be apart of the homeschool "fun" each day. At times, I need an encouraging reminder to make a conscious effort to include a little Tot school into our schedule. In reality, although I definitely embrace my ministry calling to homeschool my children, I can not let that get in the way of my first and most important ministry...motherhood. In the busyness of teaching pronouns and times tables, I never want to view my littlest of Littles as a nuisance or pre-occupation. Some intentional effort on my part to include him at the "school table" goes a long way to bolster our relationship as well as secure some sanity to our day. For the next few weeks, I hope to produce a Tot Trio series...a series of posts that illustrate three tot-friendly "school" activities that can be used that week to capture the heart and mind of your tot. A bucket of kid-friendly magnets and a cookie sheet can supply some momentary entertainment as well as some great practice in hand-eye-coordination. Greased Lightning enjoys coloring, but adding the textured underside of a wooden puzzle makes for a fascinating kinesthetic element to an otherwise normal coloring page. He loves the bumpy feel as he passes his crayons over the paper. I have a large assortment of clean bottle caps that I use for various homeschooling activities, one of which is color sorting. With the aid of an old muffin tin, Greased Lightening can sort out caps into color, size, or even shape. Most of the time, he just enjoys dumping them in and out of the "holes", but occasionally, there is more method to his madness. Love the ideas. I think since I am dealing with Tiny Tot teaching, Greased Lightening's posts will be the most handy! I know this is a year later, but thought I would let you know I am using all of your Tot Trio series!!! Thank you for posting!